Pizza has got to be one of my favorite foods, and there are so many ways that you can normally make it. 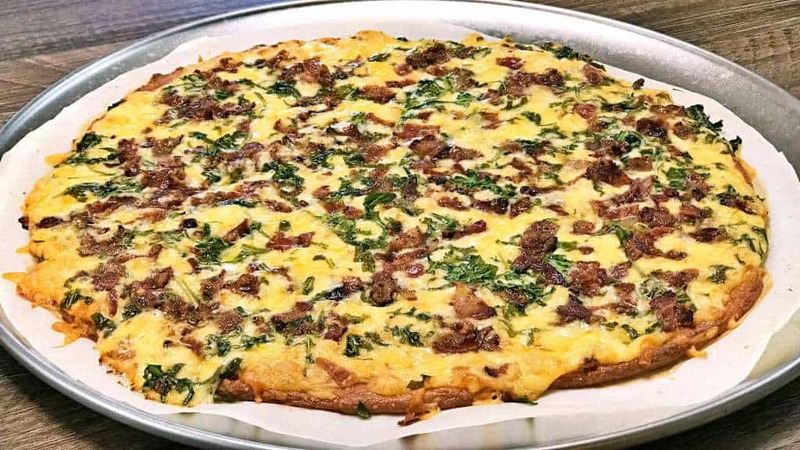 Just because you are eating Keto does not mean that you have to go without Pizza for the rest of your life, it just means that you need to re-learn how to make it! 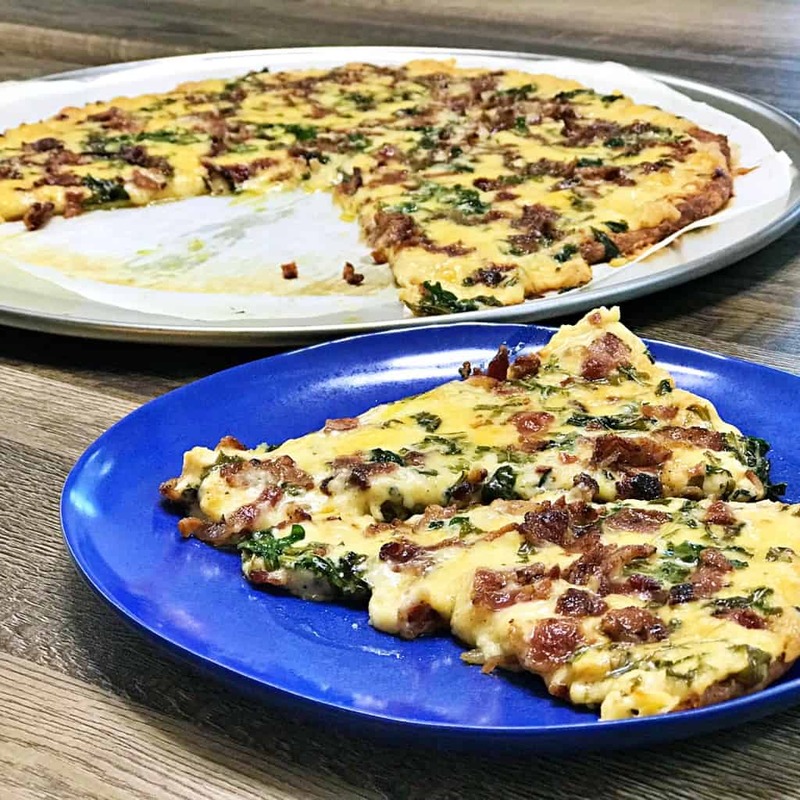 This Keto-friendly Bacon Alfredo Pizza is meant to serve as an inspiration for you to branch out and experiment with some of your favorite keto pizza toppings to make it your own. Spice it up with some Jalapenos, or toss some Black Olives on there, do what YOU like. In the nutritional facts for the recipe we accounted for all of the ingredients we called for in the video, but in actuality we probably only used about half of the Alfredo Sauce that we ended up making so the Pizza will have slightly less calories, carbs, etc if you don’t use all of the Alfredo Sauce on your pizza either. Check Out Our Keto Pepperoni Pizza Recipe too. Pre-Heat the Oven to 425*F.
In a Large Frying Pan over Medium-High Heat cook up 1 Pound of Uncured Bacon strips, and set aside on a plate lined with paper towels. When the Bacon is ready, chop it up into small pieces. Prep your other Pizza Toppings by Chopping up 1 Cup for fresh Arugula, Shredding 1/2 Cup of Mozzarella Cheese, 1/2 Cup of Smoked Gouda Cheese, and grating 1/2 Cup of Parmesan Cheese. In your Large Frying Pan add in 1/2 Cup of Grass-Fed Butter, and melt that. Add in 2 minced cloves of Garlic, and saute about 1 minute until fragrant. Pour in 2 Cups of Heavy Whipping Cream, season with 1/4 Teaspoon of Ground Black Pepper and 1/4 Teaspoon of Pink Himalayan Salt. Stir together well and bring to a slight simmer. Remove the Frying Pan from the direct heat, and add in 1/2 Cup of the grated Parmesan Cheese, and stir until melted. Return the Frying Pan back to the Medium-High Heat and simmer to thicken to your liking. For the crust we will be making a Fat Head style pizza dough (feel free to add any additional spices or seasonings of your preference to the dough). In a Large microwave-safe bowl add 2 Ounces of Cream Cheese, 1/2 Cup of Shredded Mozzarella Cheese, and Microwave on High for about 60 seconds. Remove to stir, and Microwave again for about 30 more seconds until the cheeses appear melting together but not cooked. Add 3/4 Cup of Almond Flour and 1 scrambled Cage-Free Egg. Stir together with a form to form a dough. Line a Large Baking Sheet or Pizza Pan with Parchment Paper to prevent the dough from sticking to it. Roll the dough out, and then poke holes across it with a fork to help it retain its shape. Bake the Crust @ 425*F for about 8 Minutes. Remove Crust from Oven and place on the Counter to prepare to add the sauce and toppings. Add the Alfredo Sauce, with enough to cover all but the outer edges of the crust with a nice moderate layer. Top with the Smoked Gouda Cheese, Arugula, and Bacon. Bake the Pizza @ 425*F for about 15 or so minutes, or until the Cheese on the top is bubbly to your satisfaction. Makes 8 Slices, which you can serve right away or refrigerate any left-overs for up to a couple days later if needed. Why does the bacon need to be ,uncured? In recipe it says 2 oz cream cheese but video says 2 tbsp cream cheese. 1 oz cream cheese= 2 tbsp cream cheese. Did not catch that until after my dough was mixed and did not look like yours . I did the same thing…. This pizza is incredible!! Thank you so much for satisfying my pizza craving!! This will be our Friday night regular! I’m confused by nutrition info provided with this recipe and concerned as it appears way off. I entered the ingredients in my CM app and got VERY different numbers! Thoughts? This is pretty significant and I’m glad I didn’t take the nutrition info as provided – as it would have impacted my macro’s and calorie restriction goals pretty dramatically/ negatively. We use a combination of the Labels on the packaging used, and then MyFitnessPal is often used to calculate the values for the fresh ingredients that do not come with labels. I also entered the recipe on My Fitness Pal – a couple of the items had calorie counts that were way off (garlic had 1280 calories – I find that a lot in the app – you have to search for alternatives that are correct) So the calorie count isn’t quite as bad as 700+ but it’s about 535 for one slice – that’s pretty high!!! The Keto eating lifestyle is based on net carbs. So many people get so focused on minor things like being off one carb or some calories. REALLY!! As a nurse and one who has been on several eating plans in my 55 years of life, I know that it’s not just about the nutritional value. Some people have food allergies that they’re not aware of and are causing inflammation that leads to weight gain. Some people want an overnight fix and some people want to blame everyone else for their own poor choices that put them in bad health. If people were to go to a fancy restaurant and argue with a top chef about MACROS they would be escorted out of the restaurant. So please stop with the self-absorption of being a food police. If you’re eating well kudos to you and if honor di something about it but stop making it someone else’s fault that you’re not eating the correct amount of carbs, dats, potassium, etc. 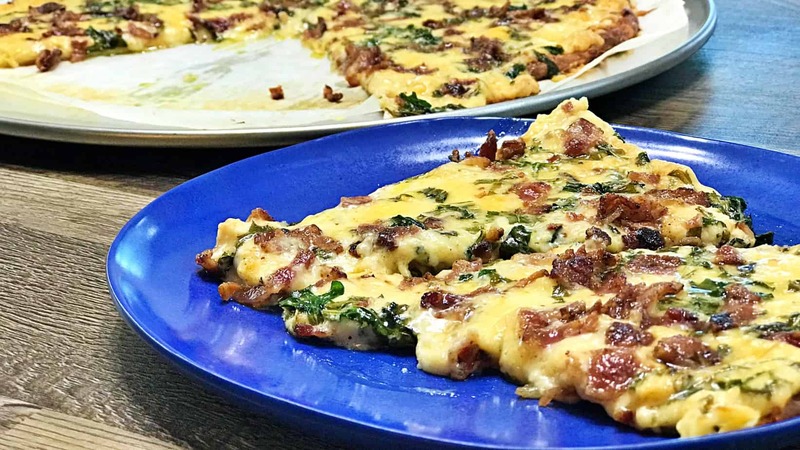 Thanks Keto Daily for helping people out with recipes and Kudos to all of the people who aren’t playing the “blame game”!! Yes, there are some misspelled words in my recent post due to my autocorrect! How appropriate! I think some people may think they’re the “auto-nutritional correct”. Looks yummy can’t wait to try it. This was amazing. The real star of the show was the Alfredo sauce!!!! Wow, will make again. I am allergic to nuts. Is there any other flour i can substitute for the almond? This was excellent! Will be making it again. Thank you! The video says 1 cup of Mozzarella cheese but the written recipe here says 1/2 cup. I thought the 1/2 cup of Gouda looked like the same size as the cup of Mozz. Also I substituted the Gouda with Havarti (zuz it’s all I had) and it was awesome! !